dbcOS Engineering Console ECON Graphical frontend and data analysis tools. All software we provide is developed in-house and all software tools required to maintain/troubleshoot our systems are inherent. The eCon client system or "Engineering Console" was originally developed to serve as a Microsoft Windows-based client for the LOGIC Technologies, Inc. Signal Server Technology system. Over time, through in-house innovations and customer requested enhancements, the application and associated tools have evolved into a full-blown graphic-based statistical analysis development suite for production systems. Real-time statistical information related to a production system is basically meaningless to an operator until its properly formatted. The eCon client system provides all tools required to design, develop, implement, and utilize comprehensive operator interface screens. Users with the proper security clearance can quickly develop interface screens using the user-friendly graphic tools provided. Screens can be developed using a variety of sources as a graphic base. Tools are provided to allow a user to edit and/or create bitmap base images. Labels and their associated signal resources are selected and placed on the graphic base using simple drag and drop methods. The eCon client suite includes a built-in WEB server. The system automatically creates HTML/PNG representations of each graphic screen developed. Upon demand, the WEB server will update the representations with current system statistics and deliver them to the Internet or the customer's intranet. Each DBC/OS32+ server system includes a site license for our eLOGIC client application suite. This LAN-based tool is a Microsoft Windows-based application that can be installed on any Windows-based PC located in the facility. The application provides full access to the control system control panel. The client application also provides advanced graphic screen creation tools and data collection capabilities for the system. The input and output definitions of the system are stored in a signal database. Tools are provided on the user interface screens to allow authorized users to quickly modify and/or add system digital or analog I/O points. A trained operator can accomplish system enhancements that require additional I/O points or even racks with little or no assistance. A system can even be setup to communicate with I/O rack chains provided by multiple manufacturers simultaneously. The eLOGIC client application suite provides simple-to-use tools that were developed to allow a user to define graphic displays for system monitoring purposes. The toolset includes common drawing tools along with the necessary tools to quickly associate graphic objects with DBC/OS 32 server and I/O events. eLOGIC systems are initially implemented with a rich set of alarm condiiton notifications. The user interface also provides tools to allow authorized users to define new condition monitors and notification methods. The control systems are developed using a simple script language. The eLOGIC client application suite provides all tools required for your operational experts to modify/create and deploy programs. Long-Term historical information is stored for analog values utilized by the systems. Screens are made available to allow the user to view the detailed analog values in graphic trend chart or standard list format. The I/O display screens of the system allow an authorized user to remporarily override the automated control of system outputs to control solenoid valves, motor starters, etc... during troubleshooting processes. 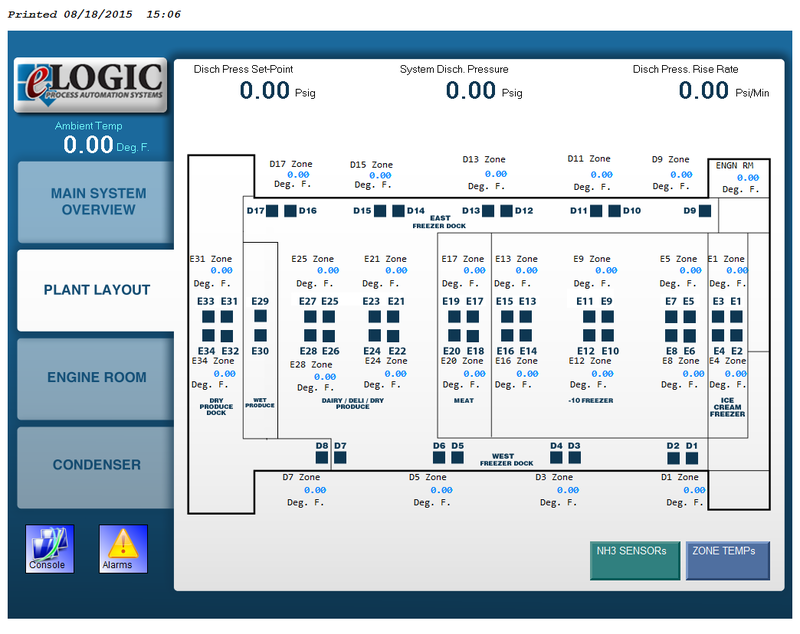 eLOGIC systems are implemented on a logical mechanical system component level. The user interface provides screens to allow authorized users to define control procedures based on the logical components of the system. The eLOGIC client application suite provides facilities to export report layer information into a Microsoft Excel spreadsheet for further analysis and formatted reports. Each system implemented provides an abundant set of predefined reports. In addition to the standard reports provided, the system provides tools to allow authorized users to quickly create custom reports that reflect the plant's daily operations and procedures. The eLOGIC client application suite provides tools to allow a user to define HTML pages and associate system values with HTML tags in the pages. Once defined, the application can be used to serve the pages on demand over the Internet or a customer's intranet. In effect, this functionality provides you with thye ability to provide WEB-based statistical analysis snapshots of the system to remote users on demand. The system provides the functionality required to send text-message alarm notifications via STMP email procedures. This feature utilizes the customer's SMTP server to notify specific users (defined for each relevant alarm) when critical system alarm conditions exist that need to be addressed. The eLOGIC system includes all tools necessary to implement an automated preventive/scheduled maintenance system. Once implemented, the system tracks maintenance requirements based on the runtime statistics of the mechanical system. One of the newest festures added to the system allows the system to notify key personnel of alarm conditions vie telephone. This feature utilizes voice synthesis technology to call specific users (defined for each relevant alarm) and inform them of critical system alarm conditions that need to be addressed.